I had a discussion with a fellow doctor who assured me that conceale weapons are dangerous and only lead to more violence. He wassindeed pretty ignorant. This link cites great examples to use when arguing with the drones. Lmstncwby, Sekol, rayw and 7 others like this. Nice try, but we can't win em all. Sometimes the only possible victory is proving that a rational conversation is possible. GUNGUY49, TexasJohnBoy, trippinhard and 3 others like this. You may never know what the seeds you plant will later blossom to be. GhostHorse and TexasAviator like this. 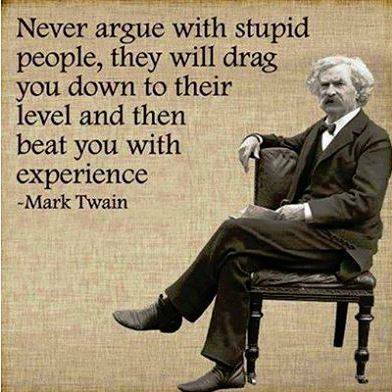 Excellent post but Mark Twain is write! I hope more people in Chicago get their permits. More than anything else, that should quiet things down significantly over the next few years. Last year a psychiatric outpatient opened fire inside a psychiatrist's office at a hospital near Philadelphia, killing his caseworker and slightly wounding the doctor. The doctor shot the gunman with his personal firearm. If the doctor was not carrying, the patient would likely have gone on a shooting spree in the hospital. The only way to stop a violent attacker is with even deadlier violence. Sticks and stones may break your bones but my 1911 will kill you. Pollard1911 and WartHog354 like this.